The 450 military veterans enrolled as Tarleton State University students have some new, well-placed mentors – faculty members who also served their country. Dr. James Vardalis, head of the Department of Social Work, Sociology and Criminal Justice, discusses a new mentoring program for veterans with student Sidney Cavanaugh, a veteran of both the U.S. Coast Guard and Texas Army National Guard. The newly developed Faculty/Student Veteran Mentoring Program pairs students who have served in the military with faculty members who also are veterans. The goal is to help student-vets make the transition from military to civilian life. “This is not a counseling program, the faculty members act as academic advisors to these first time students,” said Jim Vardalis, head of the criminal justice department and former Marine. Vardalis, Associate Vice President for Marketing and Communication Rod Davis and Veterans Affairs Coordinator Elizabeth Johnson started the mentoring program a few weeks ago. Since its inception, 12 faculty member veterans have committed themselves as program mentors. “Summer time has a limited staff, these numbers are expected to rise in the fall, when all the faculty is back to work,” Vardalis said. Tarleton State, along with the rest of the Texas A&M University system is rated military friendly, according to Davis. The designation means programs are in place to support military personnel returning to the classroom. “Tarleton’s veteran students, some with as many as 10 years military service, are typically more mature and goal oriented than high school graduates entering college for the first time,” Davis said. After years in military service, returning to a college classroom can be a daunting experience without the help of a knowledgeable mentor. “What these students need is someone to help them navigate through the obstacles that all new college students face,” Vardalis said. Monica Larina, a former Tarleton student and Army veteran, said Vardalis was a strong advocate for student veterans before the program started. With the possible drawdown of troops in July, more military men and women will be returning home and using their government earned Hazelwood Act and GI Bill benefits to start college careers. 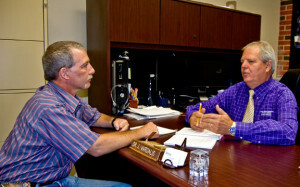 Plans are being made to set up a page on the Tarleton web site listing faculty members who have volunteered as mentors. Students will be able to locate faculty members who have served in the same branch and call on them for guidance with their degree programs, specific classes or general academic questions.